When planning to self build your home it is important that you have every aspect of the build accounted for correctly. You must then see that you stick to the budgeting during the build otherwise you will encounter financial problems at the end of the build and end up in debt. Before you even start to build your home you must make a detailed list of every aspect of the build. Try to put this into sections that will correspond with the stage payments from your lender. If you already have the finance still try to group each stage as it will help you keep on track throughout the build. Once you have a list you will find it is very long and could show large items such as roof trusses or small items such as toilet rolls for the workers toilets. Put a price against each item and then add up each stage. Frightening isn’t it? This list will give you a price for your build. By the way did you add the cost of the land? Before submitting this price to your lender as the cost for the build add ten percent to cover other contingencies. This should be the total money needed for the build. Transfer the list and your figures to a spreadsheet on your computer and as you work through each stage put the price spent against the initial calculations. The moment you see that you are overspending you must cut back on something else. 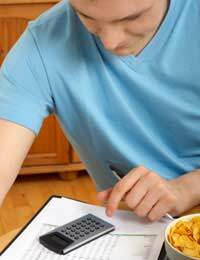 In fact before you spend the money make sure that you do not go over the budgeting calculation. If necessary find another supplier. Yes, it is possible to make one claim at the end of the build that will recoup the VAT spent on the self build. Do not rely on this during your original budgeting. If at the end of the build the VAT refunds means you have money over, put it to good use, perhaps by reducing your debt with your lender or improving your new home. When employing subcontractors for your build make a contract with them, this way you will not go over your initial budgeting figures. Remember, your build could last a year and prices can go up. By getting as many agreements as possible with suppliers and contractors you should not spend any more money that what was originally budget for. If, near the end of your build, you find that you have exceeded your budgeting then you will have to make cut backs on any further spending. Perhaps fit a slightly cheaper kitchen and landscape the garden yourself rather than employ a designer. But, it would be a shame that so much work had gone into your new home only to have the part that is shown, for example the fixtures and fittings, let you down as you did not have money left to spend on good quality items. Ask a member of your family who may not be as ‘hands on’ with the build to keep the records for you. They could be instrumental in making sure you stick to your budget and do not waste money.